Today was a stress management day, I’ve been way to frazzed with the workload around finishing up my degree and needed to get out and blow off some steam. What better way than a trip to the range? Well, how about a trip to the range with 15 or 20 good people! Yep, I made it to the Dallas Area Blogshoot and enjoyed myself immensely. We had a number of local bloggers including U.S. Citizen, who got us the location, down by the Trinity river, The Redneck Engineer who brought a homebrewed .50 amongst other toys and graciously let me shoot his Mosin-Nagant, and Bob from 3 Boxes, whose table I shared. I also got to shoot Nick The Blogless’s Saiga-12. It’s moved WAY up on my must have list. We also had some guests who came from further afield, including Southern Belle and KX59 from down around Houston, Borepatch and Mrs. Borepatch drove in from Georgia, and Kevin from The Smallest Minority drove in from Arizona. 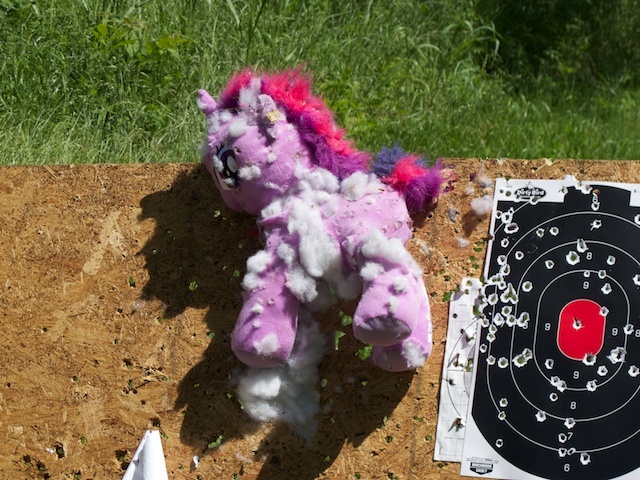 A good time was had by all, much ammunition was expended, many targets were ventilated, including Hope-N-Change the magical unicorn. Poor thing, with all the unicorn farts spread over that range it’ll probably get closed down as a superfund site or something. The best part of the day was being around a bunch of kindred sprits. I didn’t worry once about walking away from a table of guns and ammo. Nor was I concerned that someone was going to violate one of the 4 Rules. Now to see which fades first, the smile on my face, the bruises on my shoulder, or the sunburn (that’s pretty much a riff of Bob’s statement, but I couldn’t have said it better so I’m copying it). And here’s the guest of honor, Hope-N-Change, slightly worse for wear.